Some excerpts from our interview with author Ann Leckie, which initially appeared in September’s State of the Thing. St. Louis, Missouri native Ann Leckie is a woman who’s worn many hats over time, among them that of waitress, receptionist, and recording engineer. 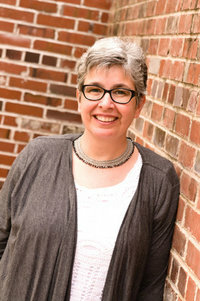 She began writing short fiction a number of years ago, but it is was with her 2013 debut novel, Ancillary Justice, that she added award-winning author to that list. In August 2014, it became the first novel ever to win the Hugo Award, the Nebula Award, and the Arthur C. Clarke Award. Loranne caught up with Ann this month to talk about the fascinating world she’s created, and new developments in the second installment of the Imperial Radch trilogy, Ancillary Sword (out October 7, 2014). 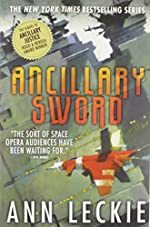 For our readers who haven’t yet had a chance to read Ancillary Sword, or its predecessor Ancillary Justice, can you give us the story in a nutshell? Basically, the main character is the last remnant of a starship that’s been destroyed. She spends most of Ancillary Justice looking for revenge on the person who destroyed her, and in Ancillary Sword she is beginning to deal with the fallout of that revenge—including the very unexpected fact that she survived it. Where did the Imperial Radch trilogy begin for you? What inspired this world? I’m not sure there was a single thing. I spent a lot of time just playing with things, putting them together in different ways and seeing what they made, and eventually the world resulted from that process. Ancillaries—and the basic outlines of Justice of Toren’s fate—were pretty early in that process, though. These are such fascinating books in terms of exploring identity and the self. In Ancillary Justice, we met protagonist Breq Mianaai (the solitary individual), One Esk (the single body as part of a whole military unit), and Justice of Toren (the ship itself) in all three incarnations. These latter two identities having been destroyed, it’s clear that, in Ancillary Sword, Breq is still grieving this massive loss. How did you find Breq continuing to grow as both a character and an individual in this novel? Breq never did think she would survive the events of Ancillary Justice. I think for the twenty years leading up, it was as though she was walking on a broken leg. It didn’t matter much if it hurt, or if it got fixed, or if the injury got worse as she went along, because she had one thing to do and once she did it that would be it for her. But having actually survived, and finding herself with a ship, and its crew, not to mention Seivarden’s clear loyalty to her, she has to find a way to navigate actually living a life, with people she isn’t just passing by on her way to some other ultimate goal. Everyone in the Radch empire uses feminine pronouns to refer to other individuals. It’s a cultural distinction for the Radch: while it is clear that individuals present as one or the other of a gender binary, everyone is “she.” I read in another interview that you hadn’t originally planned this as you began writing Ancillary Justice. What led you to this decision, and did it present any challenges during the writing process? Did it change the way you viewed your own characters? A number of things led me to my decision to use “she” for everyone. But basically, I had tried to write in this universe using all “he” and was really unsatisfied with the result. The more I thought about it, the more I decided that what I disliked was the way it reinforced the idea of a masculine default, and did nothing at all to make the world seem gender-neutral or uncaring about gender. It just made it sound like a world full of men, and how is that different from a zillion other science fiction stories? Some time during the process of drafting Ancillary Justice I read Le Guin’s The Left Hand of Darkness, which features people who are ungendered, for whom she had decided to use the pronoun “he.” Later she wrote fiction set on the same world using “she” and the effect is quite different. That solidified in my mind my reasons for preferring “she” for Ancillary Justice. It certainly did change how I viewed the characters. I had begun the very first draft assigning gender to characters and using “he” and “she” as appropriate. So characters from very early in the process were in fact assigned a gender—but as I rewrote them using “she” and as I got farther into the book, their gender and the way I visualized them began to slip around a bit in my mind, which I thought was interesting. What was your favorite scene or character to write in Ancillary Sword? Oh, gosh, that’s hard to say. There are several scenes that were high points during my writing, and many of them would be serious spoilers. Certainly I enjoyed writing Tisarwat, particularly the scene in Chapter 3, you know, that one. And Translator Dlique is a definite favorite of mine, she was very fun to write. And I definitely very much enjoyed writing the scene where, as you say, the chaos gets turned up to 11. But very often, in general, I enjoy writing stress and mayhem. I remember while I was at Clarion West (which is a six week writers workshop in Seattle, you’re supposed to at least try to turn in a story a week, which is awfully fast paced for me) I was working on something particularly difficult and getting close to deadline, and I had gotten up early to try to get some work done. I came down to breakfast and everyone said, “Ann, you’re in such a good mood and it’s so early!” And I said, happily, “Oh, I just dismembered my protagonist!” And of course they were all writers so they understood exactly what I meant. (I eventually sold that story to Electric Velocipede, and it was reprinted recently by Tor.com, “Night’s Slow Poison,” and I’m still quite fond of that scene!) So with that in mind, you can probably pick out my favorite bits without my even naming them. »For more from Ann, check out our full interview here!